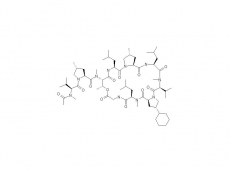 Cyclopeptides are natural product derivatives that have a novel mode of action and as such, show excellent activity against drug-sensitive and drug- resistant M.tb in vitro. These compounds exhibit bactericidal efficacy against TB in mice when administered orally. EMBO Tuberculosis 2016. SATB-082 selected as lead clinical candidate. ICAAC 2014 Abstract F-1625. Background: Griselimycin (GM) is a natural cyclic peptide isolated from Streptomyces species. Lead optimization of GM resulted in identification of a novel synthetic analog derivative Cyclohexylgriselimycin (CGM). DNA Polymerase sliding clamp (DnaN) has been revealed as the target. The anti- M. tuberculosis (M.tb) activity of CGM is further profiled here toward understanding the potential of the compound and of targeting DnaN. Methods: In vitro activities (MIC, MBC, Time kill curve) were determined in broth culture on M.tb strains (H37Rv and clinical strains) and within macrophages. Pharmacokinetic (PK) parameters were determined in mice. To assess in vivo potential, BALB/c mice were aerosol-infected with M.tb H37Rv, and initiated on treatment 3 days (acute TB model) or 4 weeks (chronic TB model) post infection with CGM at doses ranging from 10 to 600 mg/kg/day for 4 weeks. Efficacy was assessed by the decline in lung CFU counts. Results: The MIC of CGM for M.tb was 0.06 µg/mL and 0.3 µg/mL in broth culture and within macrophages, respectively. The MICs for CGM were similar across different M.tb lineages and strains mono-resistant to anti-TB drugs. Time kill curves revealed a strong in vitro bactericidal activity. PK parameters in mice were favorable: after a single administration of 30 mg/kg, there was 89% bioavailability with a Cmax of 2.6 µg/mL, T1/2 of 4.3h and AUC of 23,000 ng·h/mL. In the mouse model of acute TB, the minimum effective dose (MED) of CGM was 50mg/kg, and the minimum bactericidal dose (MBD) that induced 2 log10 reduction of initial lung CFU was 100mg/kg. In the mouse model of chronic TB, 100 mg/kg CGM reduced lung CFU similarly to Rifampicin at 10 mg/kg. Conclusions: CGM is a new anti-tuberculosis antibiotic that demonstrates potent bactericidal activity in vitro and in vivo and is effective against drug-resistant and evolutionarily distinct lineages of M.tb.